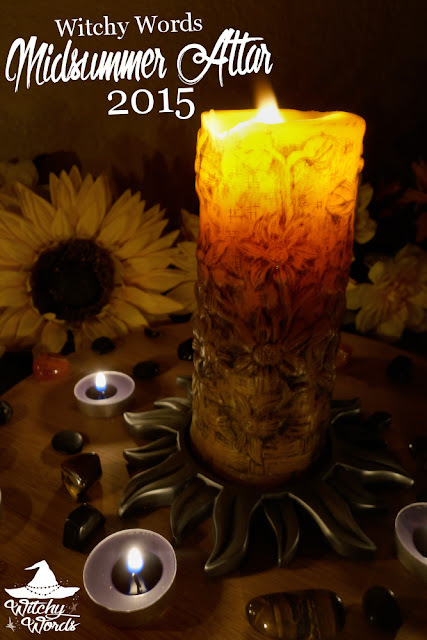 To see my 2014 Midsummer / Litha / Summer Solstice altar, click here! Midsummer celebrates the longest day of the year with a focus on the sun, which is considered a masculine entity. Because of this, my altar carries this masculine influence through all elements, starting with the colors. I prefer to stick with yellows, golds and oranges, all colors associated with the sun and all strongly masculine in nature. 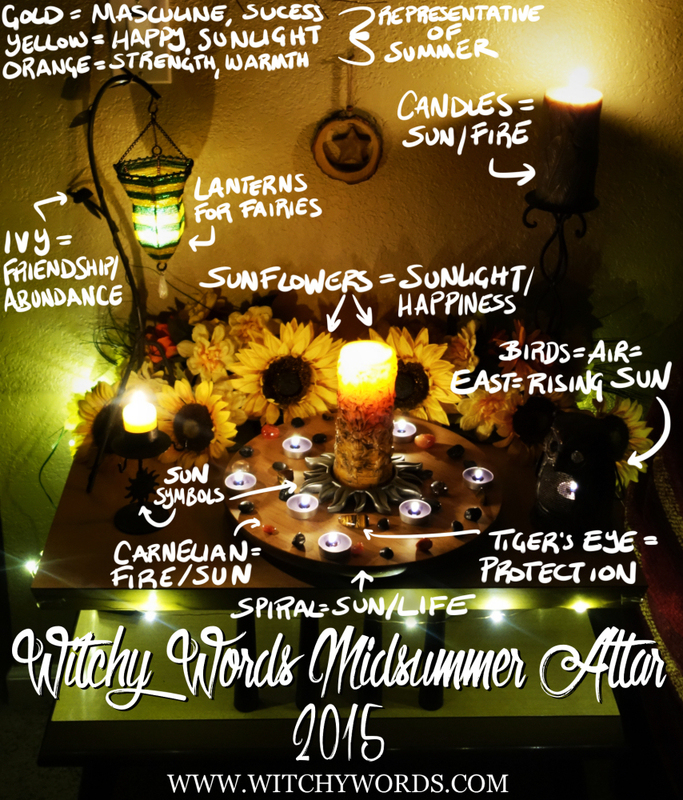 As in previous years, my Midsummer altar uses a multitude of candles as they symbolize light, fire and the sun. Most of the primary candles on this altar are either yellow, which emphasizes the sun. There's also a green pillar candle carved to look like leaves. This candle represents the greenery found in a fertile summer. The tealights on this altar are black to match the stones that create the spiral in the center. The black also represents the lengthening of night from here on out. The spiral is representative of the sun and of unending life. It is built from carnelian, which is a strong fire and sun stone, as well as Tiger's Eye, which has protective properties. Because Midsummer is closely tied with fire, it is a great time to create protective amulets and charms, thus the inclusion of Tiger's Eye. The rest of the stones are black river stones. The stones and candles spiral inward to a sun-shaped candle holder. The pillar candle on top is yellow and carved into it are sunflowers and symbols of summer. The center spiral is built in such a way that it is interactive and can move. A Lazy Susan will give you this effect. On the right side of the altar, I've placed an owl lantern which will be used to lead my circle to the ritual area. Owls are night creatures most often found out and about just before daybreak. Birds are also representative of the east which is where the sun rises. Midsummer has been closely associated with the rising sun because of Stonehenge. While there is plenty of sun symbolism on this altar, you can also find other references too! The lantern on the right is hung from a stand shaped like ivy. Ivy is representative of friendship and abundance. This is particularly relevant because the lantern it leads to is designed to attract fairies - and we would only want the friendliest fairies with the most to give coming towards the altar. While this altar doesn't have a ton of variation from last year, I've still enjoyed putting it together. It may be a while before I can stray from the interactive spiral in the center of the altar. Until then, I'll simply update it as things come my way - such as the lanterns or the sun-shaped pillar candle holder. Stay tuned for Liithi Lushede's public Summer Solstice ritual! I LOVE your altar posts. I see them on Pinterest all the time. The white cursive is so distinctive, I always know it's you. Thank you so much! Glad to know they're so recognizable. I truly appreciate it! I am impressed with all the symbolizes you put into your altars. 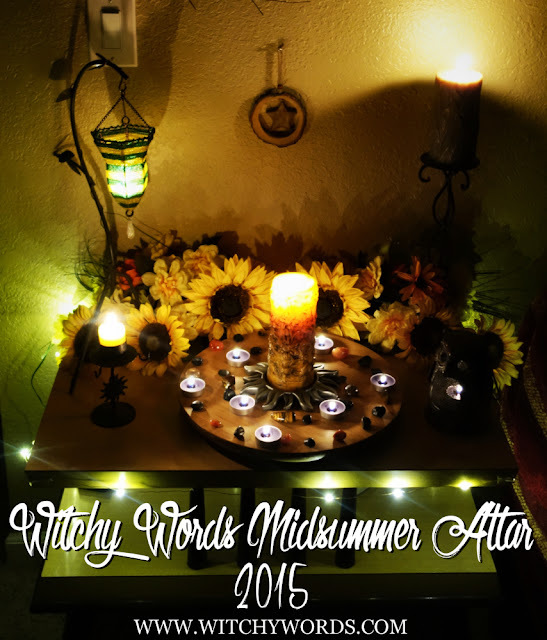 Thanks for sharing your home and your projects, you've given me ideas, since I am new to all things Witchy. Have a great summer though and BLESSED BE. Thank you so much! Altars are typically whole-day projects for me, but they're incredibly fun and relaxing to put together. I'm so glad to hear that you enjoy them! Good luck on your new path! Thank you so very much for all the resources you have provided me, since all this is new to me I have been going crazy downloading everything from AleisterAleister Crowley to old manuscript of the Golden Dawn Society to the book of Enoch. But with the suggestion you've given me it helps me to focus. All the other manuscript I had to delete it was taken all my space on my Drives. Thanks again, until we speak again. I'm so glad I could help! Best of luck to you on your path!